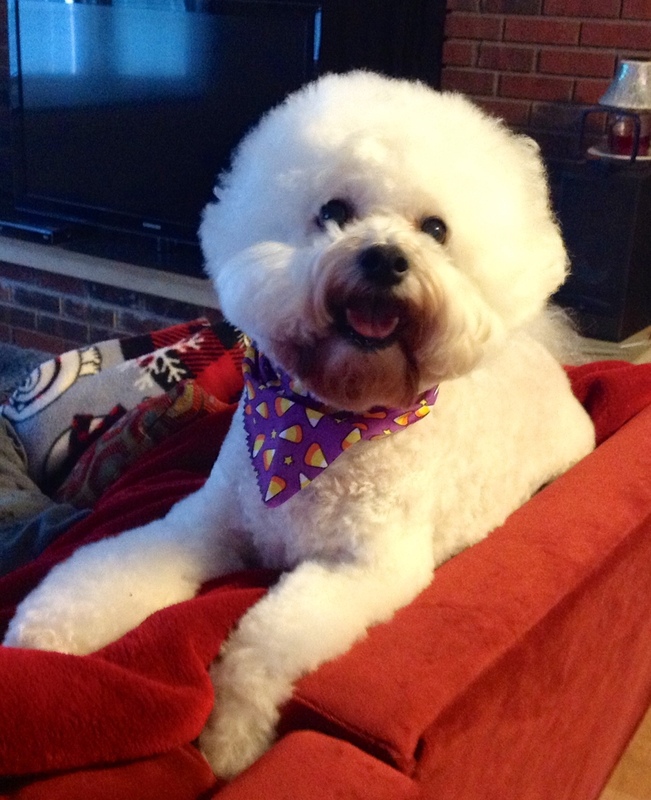 You came into our lives twelve years ago in late August 2001, a compact Bichon bundle of playful love, in a pre-arranged handoff at an I-64 road stop. I had ordered you by phone from a breeder in Myrtle Beach. It was instant mutual love. We decided to call you Truman, and it fit you just right. Rarely, but it does happen, a mind-boggling event brands itself into memory and we never forget what we were doing and where we were at. My father often reminisced that early Sunday morning, December 7, 1941. For me, it had been November 22, 1963 and July 20, 1969 that stood out. And now a third: You were getting your first shots. Our vet, a dog show judge, was admiring your confirmation, saying it was the best he had come across among Bichons in his practice, when the news broke of horrendous misdeeds. It was September 11, 2001. Now that’s one of the compelling reasons I’ve always been drawn to dogs and cats. Unlike many humans caught-up in calculated self-interest with cruel consequences, they want only to love and be loved. You loved everyone and they loved you. But you gave me preference, waiting at the door for Daddy’s entrance, then bounding up with enthusiasm on my legs. How wonderful to come home daily from a world of stress and non-entity to unconditional, uninhibited affection. You liked roaming the perimeter or fence line. Your joy was complete when you heard neighbor dogs bark and scrambled full speed for canine fellowship. I had read somewhere that for all their human contact, given a choice, dogs prefer their own kind. I can understand that, sometimes myself opting for their company over that of homo sapiens. I remember how tiny you were at first and that there were several times you squeezed through the board fencing, even though I had spent days in winter cold nailing chicken wire over the gaps. There was the time you got into the neighbor’s yard behind us where several llamas grazed and I climbed over the fence to rescue you from an advancing llama, only to have it come after me. I grabbed you and jumped over to safety. Close call for us both! You liked walking on your leash with me down the street. I never really had to train you at it, since from the beginning you took instantly to walking at my heel on my left, seldom pulling to get ahead. But I did enroll you in an individualized obedience course. Unfortunately, your trainer relied on treats and I could never find a way to wean you away from your addiction and do something simply because it was worthy for its own sake. But then our own children aren’t all that different. Getting you to stay was simply impossible for someone as passionate as you. The gold standard was to take you to a safe area of a shopping mall and get you to stay. I didn’t even try. $300 dollars down the drain. Ironically, you trained me! Still, you did retain the habit of sitting on cue right up to the end, until your arthritic limbs compelled my pardoning you. You liked keeping company with us on the couch, snuggling up to Karen and me. You also had this funny habit of flipping the pillows off the couch and finding your way to the other arm and propping yourself up for a cozy snooze. You also had this cute habit of carrying your metal dish over to your living room pad after your evening meal and licking it clean. You delighted us with this gesture from the time you were a pup up almost to the end. How excited you got to go outside with me to feed the birds whenever you saw me filling the plastic pitcher with seed! At night when we turned out the living room lights, always the landmark clicking of your nails on the hallway floor as you made your way to join us in slumber. When you were seven they found a heart murmur and I felt then the first scary pangs I might lose you. You liked to run at full speed. Around age nine, they found calcium crystals in your bladder, and so they put you on meds and a special diet. I don’t know if the crystals caused you any discomfort. You always acted the happy part. At age eleven you had slowed down and seemed to labor in your walk. We put you on glucosomine for that. Just after your twelfth birthday, or this past June, I took you in for another checkup for the crystals and arthritis. The ultrasound was distressing, showing not only more crystals despite your prescribed diet, but a tumor over the right adrenal gland and a nodule adjacent to the left adrenal. Ominously, the tumor occluded the vena cava, making any surgery risky. The follow-up radiology report didn’t clearly indicate metastasis, but it remained a possibility. You were still your active self through June, but then came the weight loss. Once a robust 21 pounds, you were down to 18 by September, and 14 by the end. You found it difficult to shadow Daddy from room to room and pretty much snoozed on the couch most of the day. Your dark black eyes, tinged with sadness, gave off a pleading gaze–as if to say, “please help me”! I knew things were getting really bad when you increasingly turned away from your food or ate very little, though I tried tempting you with lots of treats and canned meat in place of your former kibbles. You were always crazy after peanut butter filled bones, but now you no longer could muster the appetite to enjoy the feast. It hurt you to walk and even to lie down. You couldn’t hold your water. That last night, Tuesday, I knew we needed to do the right thing when you let out two yelps, one of them when Karen tried to pet your head. Obviously you were hurting all over. I caught myself in my own selfishness. I had wanted to keep you forever. I should have been thinking about your interests. I needed to let go as my ultimate gift of love for you, my friend, our friend, always kind, gentle and loving. Yesterday at the vet’s, we were with you in your final moments. You seemed unafraid as I stroked you and laid a last kiss on your darling head. You went quickly and peacefully into that long sleep. No more suffering. I know that death is part of the deal we make for life, but it doesn’t lessen our grief or bridge the emptiness. We miss you terribly. You were a gift of love and we thank you for the daily joy you brought into our lives. You will be in our hearts forever. This entry was posted in Reflections and tagged Business, Harry Truman, June, Llama, Sunday, Truman, Truman Show, United States. Bookmark the permalink. Time is a great healer, but never forget the love and happiness TRUMAN gave you and you gave back, Truman and Gatsby can now play together. I hope you get my reply, Pat. Thank you for your comment, which gives me comfort and strength through your sharing your own loss. …Beautiful, Ralph – with the capital ‘B.’ Thanks for generously sharing something so precious to you.